He is the law. Back in 1977, the British magazine 2000 A.D ran the beginning of a legend when it published the first appearance of Judge Dredd. The legendary lawman of Mega City One went on to become one of the most recognizable characters in comic book history, which led to a big screen adaptation in 1995 starring Sylvester Stallone. The film, though enjoyable, didn’t really do the source material justice. Now, in 2012, another film starring the helmeted judge is out, but does it hit its mark? Directed by Pete Travis (Vantage Point), this film is a polar opposite to the Stallone’s Dredd. 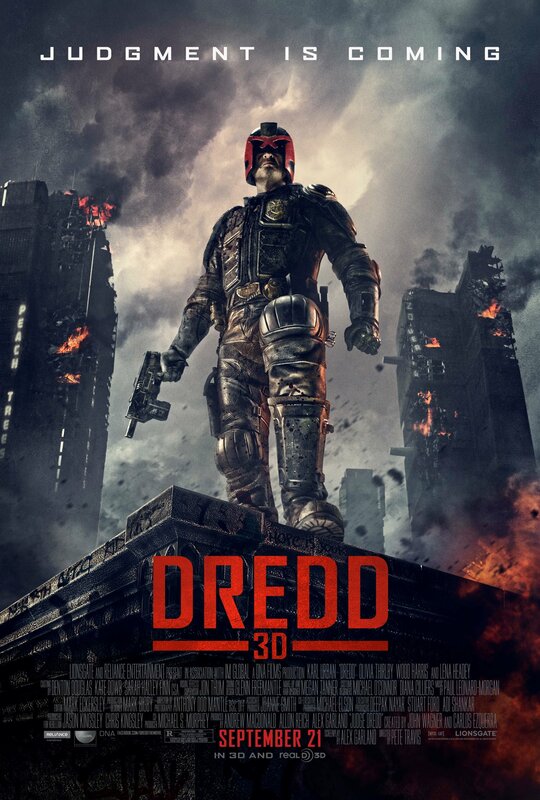 Dark, dreary and violent, this film is much more in line with what Judge Dredd is all about. The starring role this time goes to Karl Urban (Star Trek, Priest), and he does an outstanding job as the tough as nails enforcer of what’s left of the law. The helmet never comes off; the persona of the judge never stops and never breaks character. This is the Dredd we have all wanted to see, and we see him in grand fashion. The sidekick this time comes in the form of telepathic rookie Judge Anderson (Olivia Thirlby), who learns the ropes in a trial by fire. The plot of the story goes like this: in the ravaged future, Mega City One holds what’s left of society within the confined walls of the city. In the city, a new drug has made its way out: SLO-MO. The drug slows the time down to the user dramatically, and is incredibly addicting. The source is coming from one building, which houses citizens, criminals, and a dangerous gang led by the sadistic Ma-Ma (Lena Headey). Dredd and Anderson go in to the building after multiple murders are committed, and they have every intention of shutting down Ma-Ma’s operations. Now, remember that this is a rated R movie, and it earns that rating tenfold. Blood splatters, heads fly, and we see some extremely gruesome murders in the name of survival. This is exactly how a Judge Dredd movie should be, as it fires on all cylinders at the beginning and doesn’t slow down until the movie ends. It’s a shame that many will dismiss this as a sequel, because it’s one of the best comic book adaptations to hit the silver screen. If you like your action films fast paced and full of gore, then you owe it to yourself to go this this film. Previous New Pictures of New The Lone Ranger Film!